A chic water bottle? Sounds like an oxymoron. Most water bottles are sporty, utilitarian jugs with colorful logos and chunky profiles. But not the S’well. 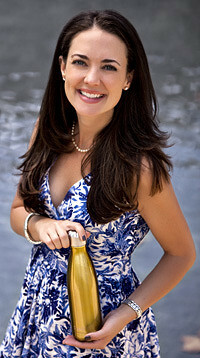 Creator Sarah Kauss wanted a reusable water bottle that would be equally appropriate at the gym, in a lunch box, or in a conference room. Performance was paramount: The S'well is engineered so cold drinks stay cold for 24 hours and hot drinks stay hot for 12 hours. The stainless steel bottle is double-walled, which not only provides an insulating layer but also prevents condensation, so you don’t have to worry about a drippy mess on your desk or in your bag. And the looks? The S’well is polished enough for the office without sacrificing functionality. The shape of the S’well makes it comfortable for drinking, and it’s narrow enough to fit most car/stroller cup holders. Plus, Sarah’s mission—to support safe water resources worldwide and to reduce plastic bottle waste—makes these water bottles even more compelling. S’well donates 10% of proceeds to WaterAid, which provides sustainable access to clean water and sanitation in the world's poorest communities. We’ll drink to that. Hi Daily Grommeteers! 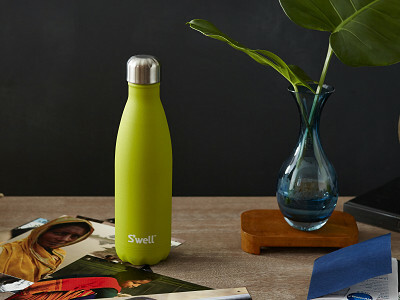 I'm Sarah Kauss, the founder and designer of S’well- a high design, fashionable, stainless steel and insulated water bottle on a mission to bring water to the world’s poorest through our unique partnership with WaterAid. I am here to answer your questions. @ Nancy Chudacoff Thanks for your question, we recommend hand washing your S'well bottle with a bottle brush or warm soapy water. The top has to be unscrewed to drink from the bottle? If so, too bad....not my style. Otherwise it sounds like a great product. @ KH Thanks for your comments. Yes, you need to open the top before drinking. The top is easier to open than most screw-top bottles but doesn't have a "sippy top" option if that's what you are seeking. Have a great day. Is the bottle made in the US? Does it fit into a regular cup holder? Very nice design. @ Amy Thanks for your quesitons! The S'well 17oz S'well bottle fits into mostly all cup holders- it is 3 inches wide. As for where S'well bottles are made, below is a page from our FAQs. I'm wondering if typical home ice maker crescent shaped ice will fit into the opening? @ Sparky Yes, they do! What are the dimensions of both sizes? Specifically, I'm interested in the diameter. I've been looking for a water bottle for my mom, who has an Audi with especially narrow cup holders; they fit cups no larger in diameter than a soda can. @ Lizzy Thanks for your quesitons! The S'well 17oz S'well bottle fits into mostly all cup holders- it is 3 inches wide. Very nice design. Is it BPA-free? yes, S'well bottles are BPA free! Is the inside of the bottle lined in plastic? or is it just a black plastic lid that is shown in the photo? @ J No there is not a plastic liner. S’well bottles are made of the highest quality stainless steel (18/8). Because stainless steel is safe, the bottles don’t need to be coated with a plastic liner as many aluminum bottles are. And better yet, stainless steel means that there is no metal taste to your water. been looking for years for something like this! almost felt like paying a steel worker to custom make one! @phil Sounds like S'well is the perfect find for you! Sarah and her team have done all the hard work so you don't have to. Great idea but why does it have to be made in China?? @Guest Thanks for your comment. We searched high and low and couldn't find a single US factory able to work with us. We have our own team on the ground in China to oversee quality but do wish we could make these closer to home! What is the height of the bottle? @ Ruff thanks for your question, the 17oz S'well bottle is 10 1/4 inches high and the 25oz bottle is 12 inches high. These look great for picnics--silver & blue together will please fans of the Sharks Ice Hockey team in San jose--and other similar events. Alas my usual need is for the "sports top" or "sippy" option, as I am such a klutz for knocking things over, and I really can't use two hands while driving to get a sip to keep the chronic cough from getting um, ickier. I also have an older Honda Odyssey, with an ineffectual set of "drink holders": too shallow, no hug to them, so things often topple in turn or on a curve. Please put back on Daily Grommet if, in the future, you are able to manufacture in the U.S.
Where is the Swell bottle made? I would like to know as it is extremely important to know if the manufacture of this product is complying to domestic manufacturing standards for safety---especially if it is a vessel for ingesting water. I worry about leeching, even though it is listed as a stainless steel product. I read through the comments and found it to be manufactured in China. No thank you to this product. @K Crissman Thanks for paying close attention to the things that most concern you as you consider your purchases. We groove on that ethos at Daily Grommet. Your purchases act like economic votes and they are precious and valuable. Keep on checking in as we do love to surface USA made discoveries. We can't restrict our partners to that requirement as the US does not have the available manufacturing capabilities in many product advances and technologies, at least at this time. We see territory being regained there all every year, and I am sure that S'well will be watching carefully to pull production over to the USA when and if it becomes available. They look perfect! I'd love to have one, especially the pink. For me the issue isn't that they're made in China, but they're just out of my price range. I will, however, bookmark this page for the future when I can splurge on it. @Lisa: Thanks for sharing your enthusiasm; pink is absolutely hot! Glad you added it to your Favourite List as a special treat for yourself. This is, bar none, the best water bottle I've found! No 'metal' taste like many other stainless steel bottles out there and it actually keeps water cold for three days (or liquid hot for 24 hours!). I'm amazed ~ and have bought two in different sizes. LOVE this water bottle! @ Michelle S.: So wonderful of you to stop by & share your experience, thank you! What a great testament to the effectiveness & 'flavor' of S'well. Is there a sports top option? If not, whether it fits my nearly-useless cupholder or not makes no difference for me as a driver, as using two hands to get a sip isn't safe. @ A. Marina Fournier: We don’t have a sports top option. However, the lid of the S’well bottle is easy to open and close, because of the way the threads are designed, our users have found that opening is much easier than other bottles on the market. I just received my S'well bottle and I love it. No more messy condensation puddling on the table top. I wish the mouth of the bottle were a little bit wider so that I could put larger ice cubes in it, and I wish there were a sports top, but hey those are minor issues. This water bottle is the best and provides yet another blow to the plastic water bottles that are hurting our planet. I'm wondering how these beautiful bottles fair if tumbling around in my kids backpacks or in my purse. Do they keep from leaking in these situations? @sue S'well bottles were designed to be sweat-proof and leak-proof, so they don't get things wet. That was why the cap is a simple screw top. Easier to open, and won't leak like a sport top. The cap specifically is 18/8 stainless on the outside and the Inside is made of BPA-free polypropylene with a latex-free silicone ring to vacuum seal the cap tight. @Sarah Kauss That's all I needed to know! I've placed my order and will be looking forward to using these beauties! The smaller size is perfect for my kids' school lunch boxes. I also would like to purchase this water bottle but unfortunately since they are made in China I will not. Due to bad experiences related to health issues with products made in China we no longer purchase food-related products made in China. Great idea though. @ Annie Please know that all of us here at S'well share the same concerns some of our customers have about being manufactured in China. S’well bottles meet our own very high standards for product quality and are made at our facility in China. Just the same, S’well bottles have been tested and certified at independent, accredited laboratories in the United States and Europe to exceed all FDA regulations (as well as California’s Proposition 65) and for quality and safety. You might be interested to know that we cannot find any other stainless steel water bottle manufactured in the United States. Please let us know if you find one. And do be assured, we continue to search for a facility in the United States that can manufacture the same product that matches our high standards and maintains a reasonable price to our customers. Too bad we can't make the bottle is the good ole USA. I would love to bury some for gifts but not from China. I purchased the 17 oz bottle, The design and feel is wonderful, but it doesn't really keep cold liquids cool for 24 hrs as claimed, my chilled liquid was loosing its temp after only a few hours. I think the function does not match the form. @ j. dorfman: We're sorry to hear your S'well bottle is not performing as it should. Sounds like it lost the vacuum seal. This mostly happens when the bottles are placed in the dishwasher. If you don't mind us asking, have you been following the proper use/care instructions? Here are FAQs on that. - Is my S'well bottle dishwasher-safe? No, S'well bottles are not dishwasher safe. The ThermaS'well™ technology can be compromised and the vacuum seal may fail. Also, the color wrap may become damaged due to dishwasher use. S'wells are happiest when hand-washed and air-dried. 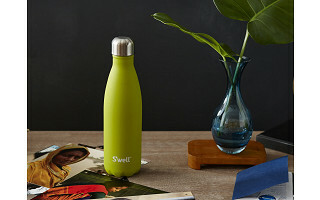 - How should I clean my S’well bottle? S’well bottles are happiest when cleaned with warm, soapy water and allowed to air dry with the lid removed. A bottle brush may be used to scrub away any residue left behind from what you put in it. If you are running low on soap, you can also clean with vinegar and baking soda. We must insist you do not clean your S'well bottle in the dishwasher; it will null and void our ThermaS'well Technology guarantee and potentially damage the vacuum seal. And the cap prefers a rinse, rather than a soak. Please don't intentionally submerge the cap under water for a long period of time-- this could result in water being trapped inside. Hello. Will more bottles be available soon? Also, will the 25 oz. bottles come in any other colors? @ Trisha: We'll have more available by 10/12 and will be sure to notify you directly. We curate the strongest colors and hope you'll consider the colors selected. @ gillian redman: will be glad to. A chic water bottle? Sounds like an oxymoron. Most water bottles are sporty, utilitarian jugs with colorful logos and chunky profiles. But not the S’well. Creator Sarah Kauss wanted a reusable water bottle that would be equally appropriate at the gym, in a lunch box, or in a conference room. Performance was paramount: The S'well is engineered so cold drinks stay cold for 24 hours and hot drinks stay hot for 12 hours. The stainless steel bottle is double-walled, which not only provides an insulating layer but also prevents condensation, so you don’t have to worry about a drippy mess on your desk or in your bag. And the looks? The S’well is polished enough for the office without sacrificing functionality.